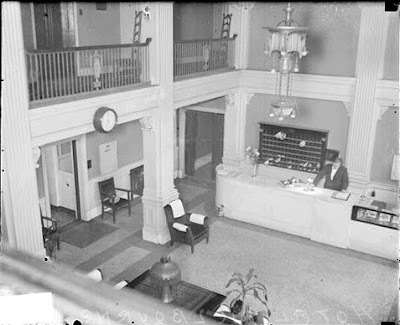 Original caption: View of a man standing behind the registration desk in the lobby of the Hotel Melbourne, located at 4625 North Racine in the Uptown community area of Chicago, Illinois. Cite as: DN-0082085, Chicago Daily News negatives collection, Chicago Historical Society. For an exterior view, go to Hotel Melbourne.